We had the biologist from Fisheries out here this past week, to do there annual check on the lakes oxygen levels. They drill through the ice in a few spots, and measure the O2 levels at various depths in the lake, and record there finding.Good news from him, with great O2 levels all the way down to 4m, the lake is in great shape and wintering well. 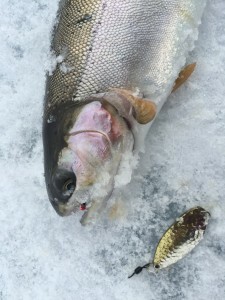 Tests on neighbouring Leighton Lake also confirmed it was wintering well. Fishing has been pretty good, one just has to find the feeding fish, they are in specific areas, that can change day to day. Friday afternoon saw some incredible fishing, I got out to cover some water and find some active fish, tied into close to 20 rainbows, with fish to over 3lbs landed. The fish were active, and didn’t hesitate, if they came in they bit! Saturday was a bit slower, much more traffic on the ice, with clear sunny, warm(hot) conditions conditions. Lots of sunburnt faces that evening.These conditions made the bight a bit tougher, still managed to land 10 myself, and most of the guys around us all saw some action, with the biggest one iced being just a touch shy of 18″. Worms proved be the most consistent producer. Sunday saw some stormy weather move in, giving us a fresh covering of snow, but no feedback on how the lake fished. Ice is still in great shape, with 12-15″ of ice all over. Some open water sports can be seen where the rocks are protruding from lake, absorbing the heat from the sun, and causing the ice to melt around them, best to stay back from these areas, they are shallow, but you will find the ice not as thick near them. 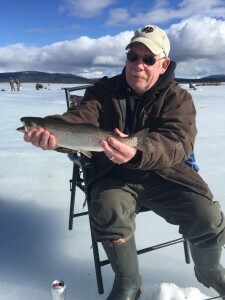 Ken B. with one of many rainbows for him on Saturday.